The Hydrate community is entering a time of exciting discovery in the area of Hydrates in Nature, and Center for Hydrate Research is no exception. With the prospect of high natural gas prices, the Center is conducting research aimed at assessing the risks and benefits in the production of hydrocarbons from gas hydrates in permafrost zones and near-seafloor offshore hydrate deposits. Work in this area includes collaboration with Lawrence Berkeley National Laboratory (LBNL) to refine hydrate production models. 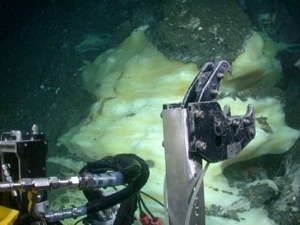 As the world tries to understand and stem the possible contribution of hydrates to global warming, the Center is also collaborating with the Monterey Bay Aquarium Research Institute (MBARI) to understand the behavior of protruding hydrate mounds on the seafloor and their possible contribution to the atmospheric methane budget. Furthermore, as conventional oil and gas deposits are sometimes found underneath hydrates, understanding the geomechanics of these formations is vital for ensuring the safety of operations on and in hydrate-bearing zones. The research in the Center aims to ensure that human activity does not compromise the safety of operations near hydrate-bearing zones. From production optimization to global warming issues to safety assurance, the Center is conducting diverse and exciting research in the field of Hydrates in Nature. Ocean hydrates at the Barkley Canyon off the coast from Vancouver, CANADA.